Granite is a natural stone and nowadays it is a very popular material for kitchen countertops and vanity tops. It is very durable and comes in varieties of colors. Only several years ago it was extremely expensive to install granite countertop, even in a small size kitchen, but with years prices dropped significantly. Now it become affordable for majority of homeowners to renew kitchens’ appearance with a new granite countertop. After kitchen cabinets are installed, it is a time to pick a color for your countertop. There are two main types of pattern in granite slabs – consistent and variegated. Consistent means that pattern and color are uniformed throughout whole slab. Variegated pattern is very irregular and can be tricky because of veins movement throughout the slab and pieces from the same slab can be very different in colors. There is another pattern called solid color, but in reality only solid black is available. 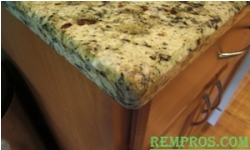 There are different types of finishes for granite countertops. The most popular is polished granite. It is very shiny and glossy finish. Another type is honed finish when surface is smooth, but not shiny. And satin finish is something in between polished and honed. A lot of counties exporting their granite worldwide and it does not really matter which country of origin the slab will be. It is just a matter of a taste which color, from hundreds of them, to choose for your new kitchen countertop. But always consider the fact that for better visual effect you should pick the color which is much different from the color of kitchen cabinets. For example, if you have white cabinets, darker colors of granite, let say Uba Tuba, will be a good choice. Colors of granite may vary slightly from slab to slab even though it is the same color. That is why it is better to go and pick your slab from warehouse. Installation of granite countertop is one of the projects that we do not considere as do it yourself. It is require proper equipment for cutting, transportation, and installation process. And by the way, granite is a very heavy material that you, probably, do not want to move by yourself. This type of a work supposes to be done in the right way. High skilled professionals will make your countertop looks nice and last for many years.